I’ve been working in the Australian healthcare industry for a few years now, and in all honesty, it’s slow progress. When it comes to tackling the critical long term challenges to fix some major holes in the healthcare system, it starts from the ground up. During Australian Healthcare Week 2014, we thought it was time to get some of the Australian healthcare leaders in a room to discuss some of the key burning questions on everyone’s lips. Several clear areas stood out, so here they are – the five questions that everyone in healthcare should be thinking about to revolutionise our system and drive real positive change. Where should the money be going? The Australian dollar is limited; nationally we spend $130 billion dollars a year on healthcare, which is 10 per cent of GDP. With substantial cuts announced in the Budget, it’s clear the pot isn’t getting any bigger. So where should we be spending the money? And perhaps more importantly – where are we going to get it from? One of the biggest challenges is making sure the funds go where they will have the most benefit; it’s not necessarily the specialist treatments and big exciting stuff. There are two sides to this coin. Firstly, who should get treatment and who shouldn’t; secondly, we need to stop focusing on sickness and focus on health. The table discussion centred primarily on the last 10 per cent of people’s lives and those that lead an unhealthy lifestyle, leaving the two intrinsically linked. We’re currently spending 90 per cent of funding on that last 10 per cent. We’re also focusing on funding facilities, with not enough action being taken to manage demand. The simple truth is, the growth rate is unsustainable and people’s lifestyle choices are smashing acute health services. Some major reform is needed to incentivise people to stay healthy. Our current spend needs to be shifted; all agree that it’s currently imbalanced. Chronic Disease management was also thrown into the mix as a better way to spend money, with more of a focus on long term quality life. Whether this starts with taxes on unhealthy foods, in a similar manner to cigarettes and alcohol, or wider initiatives around the planning and development stages of community – building in the opportunity for healthy lifestyles. The general consensus is that people have the wrong perception of healthcare. We all enjoy and expect good quality healthcare in Australia, but as we know, it’s not sustainable. Although the national reform agenda is seeing small amounts of change, it’s nowhere near where we need to be. One of the potential solutions comes in the form of private health and private insurance. More competition in the area enables it to be available at a reasonable cost. Previously seen as a luxury for the wealthy, few have a realistic concept of the cost. As announced in the Budget, the Federal Government could potentially widen the gap to accessible healthcare with confirmation that patients will be charged with a GP tax. The Government confirmed in its Budget announcement that the much speculated and controversial general practice co-payment model will be implemented. From July 1, 2015, visits to the doctor will cost everybody $7 with the introduction of a Medicare co-payment. The co-payment will be waived for children and those on concessions only after 10 visits a year. The co-payment will raise $3.4 billion in the first four years, while upfront payments and a tightening of eligibility for the prescription drugs on the Pharmaceutical Benefits Scheme will raise another $1.3 billion. It’s the continuation of a long debate around co-payment. Another $1.6 billion will be cut from health by freezing indexation of income thresholds, which determine eligibility for the private health insurance rebate, the Medicare Levy surcharge and other Medicare services. There are a few problems hindering injections of cash into the health system; inefficiencies from whole-of-regime litigation, excessive tests, limited working hours and supply and demand from private insurers. The group explored one of the key areas – working hours. Many facilities are still limited by the 8-5 pool, leaving people with no choice other than to go to hospital. Can we have 24-hour general practices, reducing the demand on hospitals in the same way many health insurers do? If the health facility functioned on a 7-day-a-week approach with staffing and services, would we be able to provide better care and reap back costs that outweigh operational running fees? The day public facilities expand the operating hours is the day we can stop building new operating theatres. There’s a trend for more 24/7 facilities – let’s fund the infrastructure but then use it efficiently. A private facility in Brisbane ran its MRI 24/7 – ends up being cheaper to come after-hours. Public health is getting better with new targets, but it’s some of these efficiency-driving measures that could make the real difference…a little more on that later. Health is the second largest area of government spend across Australia, and the forecasts aren’t looking great. National costs are predicted to increase exponentially; at current rates Treasury estimates health expenditure to exceed the entire state and local government tax base by 2043. It’s pretty clear something has to change; preventative measures are without doubt the best option, reducing the need for healthcare in the first place. 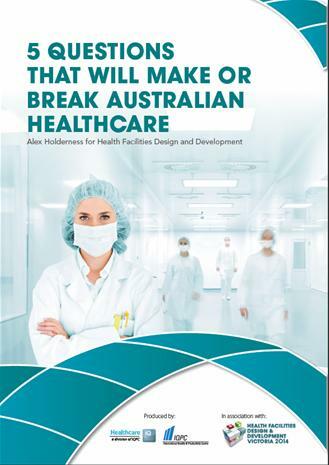 Beyond this, hospitals are the costliest element to Australia’s health system, taking up to 40 per cent of current health expenditure. With that in mind, the spotlight is well and truly on efficiency. There’s currently a big focus on technology and the potential for increased patient predictions and improved flow. For example, in NSW hospitals have begun publishing real time queue data for emergency departments. I wanted to explore the driving force behind these changes. As the largest employer in Australia, hospitals have a pretty significant resource at their fingertips that could drive some real change. With a yearly increase of around 9 per cent in emergency patients, Dr Harvey Lander, Director of Medical Services at Hornsby Ku-ring-gai Health Service is no stranger to finding ways of being more efficient. Ultimately, ensuring people don’t stay in hospital longer than they need to. “Many clinicians have inspired me over the years. Those who thrive on a sense of purpose and mastery of all facets of their profession. The most effective leaders can collaborate, coach, mentor and build superb teams. “Such clinical champions are needed to affect transformational change. We need to work together to improve our relationships and collaborate to make a difference both for patients and staff. “There’s a real potential to improve efficiencies throughout the whole process within a hospital. At the core of this change is the ability to get clinicians to the right places at the right time. “We shared and market tested with other clinicians whenever we could at clinician meetings and during VMO individual performance reviews. The intent was to make this process about involving our clinicians in a meaningful way, where our most important resource could generate ideas for improving the patient experience, care and outcomes. We have also been conscious of involving the junior medical workforce, because they are often highlighted as a forgotten group. “We want to create a positive culture to make things easier and better for our staff, beyond the targets and numbers everyone is used to seeing. We want our clinicians to see, feel and believe that we are supporting the work they do to provide the best patient care,” he said. For widespread rollout to be effective, it’s safe to say there are a few obstacles. Anyone driving change will know to expect challenges. There are still large pools of people that don’t want to be a mentor. Identifying clinical champions who are willing to get involved and drive change can be challenging. It’s a matter of passion, time, volition and skills. “Our clinicians are becoming increasingly committed to driving change that’s going to make a real difference. It’s a tumbleweed effect. Supporting these individuals is vital. We try to acknowledge their ideas and act on them, and celebrate successes to make sure our staff feel valued. This can sometimes be as simple as a genuine ‘thank you’. It also means being approachable and available, recognising the effects system demands on staff, as well as the effects of reform fatigue and burnout. And look to learn from others in Australia and internationally. Join Dr Harvey Lander during his presentation ‘Improving Patient Flow with Effective Management and Staff Engagement’ at Hospital Efficiency 2014 in July. Driving efficiency across healthcare – are nurses the answer? Australia’s productivity agenda has prompted the healthcare sector to improve efficiency, because patient demand and complex healthcare needs have dramatically increased. The sector cannot afford cost blowouts, and efficiency is the way forward for patient flow, work flow and waste reduction. Queensland Health recently set out to achieve an efficiency savings target of $214.8 million to support wage increases outlined within the Nurses and Midwives (Queensland Health) Certified Agreement (EB8) 2012. It has placed the role of nursing in a unique position to champion the productivity drive. Ahead of Hospital Efficiency 2014, I touched base with Dr Frances Hughes, Chief Nursing and Midwifery Officer for Queensland Health, to get her insights into the challenges, strategies and results of this project. Nurses are a major stakeholder in the health sector, with 66,795 nurses and midwives employed throughout the State (as of 30 June 2013). Queensland Health employs approximately 32,000 nurses, of which the nursing workforce comprises 42 per cent of the entire workforce and 61 per cent of the clinical workforce. “We are a huge vehicle for change in the health sector, and we’ve had some really exciting efficiency data relating to multiple initiatives. We’re the largest clinical workforce and have a lot of knowledge and depth of capacity to think creatively about new efficiency models,” Frances noted. Registered nurses equate to 83 per cent of the nursing workforce employed by Queensland Health – approximately 20,823 FTE. The organisation’s focus on efficiency savings has yielded an incredible $221.3 million return, achieved within 12 months of the EB8 agreement deadline. “We improved HR management and decreased high cost labour items such as agency, overtime and casual, as well as implemented criteria-led discharge and hospital in the home strategies,” Frances remarked. A performance scorecard was developed to assist with reporting and monitoring trends across nursing and midwifery services within the public health care sector. These included skill mix, sustainability, productivity and quality. This scorecard reflects the push to empower the executive directors of nursing with state-wide data to compare. More development is yet to be undertaken towards enhancements in productivity and efficiency measures this year, including a financial impact statement. Nurses are well placed to collaborate across the healthcare continuum by virtue of their professional knowledge and adaptive capacity. They are underpinned by numerous options in post-grad professional development pathways – nursing services are evident in all areas of the healthcare system including public, private, not for profit and commercial environments. With increased patient demand comes the need to also improve agility within healthcare models. Queensland Health has delivered nurse-led services through a range of business models including public/private partnerships, Medicare Locals, NGOs and community based services, therefore decreasing demand on acute services. For example, the Metro South integrated chronic disease clinic, with coordination of heart failure, renal, diabetes and respiratory clinics. It linked primary and secondary care, resulting in decreased re-admission rates. The savings for heart failure alone were estimated at $885,000 over three years. “We introduced the application of an Investment Management Framework, which demonstrated nurse endoscopy as a suitable patient-focused, cost effective, and quality solution to minimise waitlists and improve health outcomes for Queenslanders. It was supported through purchasing framework levers such as Service Line Agreement targets and incentives,” she said. Nursing is going through an innovative transformation in Queensland, but there are still lingering outdated policies and guidelines that impact the overall progress of this journey. There are also outdated models for healthcare delivery, restricted autonomy in clinical decision-making, and a significant amount of supervision that hampers development. The role of registered nurses needs to be perceived appropriately as well, to enable them to perform the full scope of work. Chronic health and an aging population are two issues in Queensland from which nurse-led services can manage, given the right framework. According to Frances, services need to be driven by patient centricity and deliver safe, quality healthcare that is evidence-based. “Nurses also need to participate in and lead clinical engagement activities and resource management processes. Furthermore, the services should integrate with business models and be a part of the development in health information technology,” she said. The nursing portfolio is going through innovation for hospital efficiency. Its influence on the direction for productivity gains is already being realised through results such as the $221.3 million saved. Data and Analytics in healthcare… The revolution is coming. Technology is sitting right at the heart of the healthcare efficiency drive and it’s easy to see why. Data-sharing and analytics, collaboration and digital practices will be the driving force behind delivering healthcare services predictively. Ahead of Australian Healthcare Week 2014, I took a look at some of the biggest emerging areas where technology is driving efficiency to find out what’s on the horizon. There’s huge potential for information to help bridge the steps towards improving patient safety and quality of care. To gain an insight on some of the key developments in Big Data and analytics, I caught up with two people on the forefront of driving the change Michael Draheim, Chief Information Officer at Metro Health South and Sarah Dods, Health Services Research Leader at CSIRO. What are the key areas where data and analytics are impacting efficiency? Sarah Dods: A lot of what we do in health at the moment is on paper. You can’t do analytics without data and we don’t have big data in health at the moment, in terms of the healthcare system and how it’s delivered, those data fits are only just starting to appear. We see three efficiency gains that are likely to happen through this process; one is prevention, if you’ve got decision support, crosschecks based on data and information that’s already in the system, there’s the opportunity to prepare and prevent things from happening. Secondly, using data and analytics operationally, in terms of people, understanding how the business itself runs and gaining quality assurance, we see patient flow as being a huge opportunity in that space and one that we’re very interested in. Finally, digital health delivery, which is another way of talking about telehealth, it’s acknowledging the data that’s collected, telehealth is not videoconferencing. There’s so much possibility because when you do things online, you’re creating data, and you can create data about the information that was shared and use it later on. Michael Draheim: Service efficiency, service planning, meeting KPIs, predictive analytics and data modelling are a few areas that stand out as opportunities to help us adjust our existing service models to support future health care service delivery. The richness of the data that we have will help us to understand more about our patients and services which in turn will give clinicians the right information to support the prevention and prediction of disease and treatment options. The impact of this is significant benefits on both social and welfare outcomes along with opportunities for the vendor market to have tools that support this approach. Where do you see the biggest barriers to growth? Sarah Dods: A lot of the things that need to be changed to improve efficiency aren’t actually technology related, but what big data in analytics can do is point you to the problem areas and demonstrate the improvements in flow on to the rest of the system if it was fixed, data is evidence for making change. There are certainly some funding pressures in both the primary and the acute healthcare systems, the fact that our primary care system is a straight fee for service regardless of outcome basis, I’m not sure it’s sustainable. But that is a very disruptive change to the way the Australian health system is run, if that ever happens. Michael Draheim: Historically, we’ve got a whole range of systems that are very disparate, built on data structures that aren’t interoperable and often duplicate the data. It’s difficult to get data out of those old fields as they were mostly free text. You may have a font of knowledge but you can’t extract it without a significant amount of cleansing. We’re now looking at better relational databases and more structure. The big advantage of that is real time categorised information flow. The challenge is dealing with our legacy and the cost of replacing that. There’s also significant organisational change involved. You also have balance the technology, you don’t want to overwhelm people with thousands of alerts which make their life really difficult. For preventative health, it’s adding those fail safes, but not making too much more work. It’s a fine balance. Have you any examples of results where you’ve seen technology directly impact healthcare efficiency? Sarah Dods: One is in terms of cancer reporting where the cancer information that’s currently reported across Australia is a manual process, it’s somewhere between two and five years out of date depending on where you look. When a cancer occurs, a piece of paper gets sent to the cancer authority, there’s about a three year backlog, and somebody then eventually manually enters it into a database. We’ve got some research that we’ve been doing working with a couple of the state cancer agencies about automating that processing of the reporting data, and it’s now getting to the point where the research certainly indicates that there’s potential to do that real-time. That’s an example where people making policy decisions or looking for unexplained outbreaks of cancer, or carrying out research will have access to be able to make an up-to-date data, it’s a huge advantage. You can then start to look at forecasting. The second example is around patient flow, we’ve been working with the Gold Coast Hospital for a few years now, and that started out working with their emergency department about predicting who was going to turn up, the question was, can you predict who is going to turn up in an emergency department? We found that using the hospital’s own historic data we can predict with about 90% accuracy in any four hour block who’s going to turn up, what the triage categories are going to be, what the specialist categories are going to be, and how many of those people are going to be admitted. Michael Draheim: We see significant results where we’ve digitalised existing practices. There’s one example where we’ve saved (from a workforce point of view) about $5 million for a couple of hundred thousand dollar investment – over 18 months, by digitalising a process. We’ve also put in voice recognition badge software which has allowed clinicians to have more time for patient care – there are direct things that have improved the overall experience. You can’t measure everything but we’re building a benefit delivery framework into all our projects post go live. We make value estimations and then we measure against that to see how we’re tracking. What’s next for big data, how do you see healthcare of the future? Sarah Dods: I’m actually going to be releasing a report on the digital healthcare system of the future at the Healthcare Efficiency Through Technology conference. I’ve been leading the work that we’re doing at CSIRO around the sustainability of the Australian Healthcare system, it’s about providing evidence for innovation, improving access to services, improving efficiency and improving the quality of care that patients get through using digital tools. We’re going to be talking about patient flow and information flow and information sharing. Michael Draheim: It’s about more improving access and the ability to collect, report, read and analyse data on the run. We’ll be taking real time data which will often predict what’s likely to happen and provide this information to clinicians at the point of care to support their decision making. The key is to support the human elements of the way our workforce deliver services with quality real time data – the challenge in the future is that we’ll have more information, it’s important to make sure this is provided in a way that adds to the quality our services provided by our staff. Healthcare Efficiency through Technology provides the ideal forum to hear from facilities who have implemented technologies to improve patient care and realise operational benefits. Don’t re-invent the wheel – network, benchmark, learn and succeed. It’s no secret demands placed on health facilities are constantly changing, which means the services provided need to be flexible. So can you really plan and forecast the needs of the Australian population? There are a few strands that emerged during the round table discussion recently held for Australian Healthcare Week 2014 . Stuart Moore (Epworth Healthcare) referred to the analytical information Epworth use during the development stages of projects and how this can help with mapping provisions: “We look at data in terms of trends in clinical areas of all sides, public and private, across Australia. We use this data to try to map out growth areas across Victoria (the market in which we operate). That information directly impacts the development projects for our existing sites. We also look at Greenfield opportunity sites in Geelong. There’s a whole range of information available from the Government that can be incorporated into plans. Anna Morgan (Southern Health) uses information based on areas of growth to gain a better understanding of the timing for expected growth in particular areas when mapping out services. The fluctuating population growth rates and behaviour predictions of those people have certainly been a challenge for health facilities in the past. So how can we really predict population? Ultimately, modelling can never be exact, but the message is to use the data sources available to make the most informed decisions. Of course, the adaptability challenge extends beyond the build of facilities to occupy surrounding communities; the service itself needs to be just as flexible. Two themes tie into the debate: the provision of services themselves and the location. Time will tell how much of an impact outsourcing and contestability will have. Projections produced by HWA in the ’Health Workforce 2025’ report make it pretty clear that without major reform in the pattern of health service delivery, Australia faces huge shortfalls in the nursing and related workforce nationwide, and in the supply of general practice and many specialities outside inner metropolitan areas. There are considerations that should be made during the design and development to start to tackle this challenge. The first is around staff and the experience they have. If we make our facilities a better place to be, we’re more likely to retain staff. The roundtable participants discussed how the biggest asset to any facility is the people who work within it, they therefore need to also be at the centre of the design. We looked at several examples, ranging from the layout of facilities to providing open spaces for staff to relax and research. Anna spoke of a recent project in Dandenong, where they experienced similar location issues. The team are in the process of building new and improved facilities at Dandenong Hospital to ensure continued access to the highest quality of care for the community. The work redevelops a number of community and ambulatory care services provided in disparate locations, bringing them into one central precinct. It’s an approach that extends existing services rather than builds new ones. We couldn’t look at location services without discussing at least part of the rural health challenge. We have an ageing population; a large number of people are retiring and moving out to more rural areas where there aren’t as many accessible sub-acute services. They currently have to gravitate back into the capitals. The population will still also continue to be dispersed – inner city health facilities are run off their feet whilst rural facilities are much quieter and come with their own workforce challenges. Australia can’t continue to be so metro-centric. Solutions need to be found and they’re expected to be driven through design innovations, extended workforce training and technology.